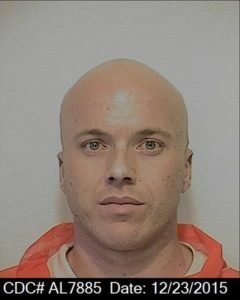 A two-strike offender from Paso Robles is on the loose after escaping Pleasant Valley State Prison in Coalinga on Monday. Brian Dill, 33, was being housed in the the minimum-security facility at the state prison. Correctional officials discovered Dill was missing during an inmate count at 12 p.m. Prison staff notified correctional officers, who began searching for Dill within minutes, a California Department of Corrections and Rehabilitation press release states. Local law enforcement agencies and the CHP are assisting with the search. Prison officials describe Dill as a white man who is 5 foot 9 inches tall and weighs 180 pounds. Dill was admitted to prison on June 29, 2012 on a two-year, eight-month sentence for convictions of vandalism, possession of a firearm by a felon or addict, DUI, possession of a controlled substance while armed and making criminal threats. His convictions stemmed from a 2011 police chase in which Dill fled on a motorcycle from Paso Robles to Morro Bay. Upon capturing Dill, officers found him in possession of an an illegally-altered shotgun and two daggers. The Tribune reports Dill was paroled in Oct. 2014 and placed on local community supervision in SLO County. Within a year, he was convicted of being a felon in possession of a firearm. Dill then received a 32-month sentence in July 2015. CDCR officials say anyone who sees Dill or knows of his whereabouts should immediately call 911 or contact law enforcement. Since 1977, 99 percent of inmates who escaped prison or a prison camp or program have been apprehended, according to CDCR. I guess he is in a pickle now. Well, escaping was his third strike then. Nope, it wouldn’t be. Escape is neither a violent or serious offense under California Third Strike Laws.